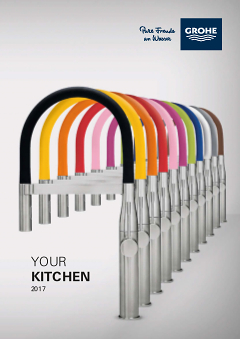 This kitchen tap of the GROHE Blue Pure range offers maximum flexibility for all your kitchen tasks. Activated using a separate handle, the GROHE Blue filter removes undesirable substances like chlorine and lime from the water, delivering a fresh table water with a great taste. This sink mixer comes with a high swivel spout and a convenient side spray. Pots are easy to clean with the powerful shower jet that reaches all corners of your work area. The GROHE SilkMove technology allows for a smooth and effortless volume control. Finished in GROHE StarLight chrome, the tap comes with an attractive, glossy sheen. A perfect choice in all respects, it will make a valuable addition to your kitchen and save you dragging around heavy bottles of water. The GROHE Blue Duo tap delivers both ordinary tap water and pure filtered water with a great fresh taste. Replacing your regular tap with this innovative and efficient model will be super easy and hassle-free. Its high spout is perfect for filling tall carafes.